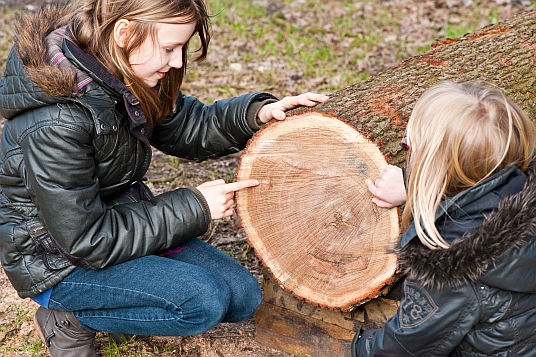 Children love to count the annual rings on felled trees. At first sight it is astonishing that hundreds of laboratories around the world utilize this method today in order to gain amazing insights. The field of application includes the dating of old Roman bridges, monasteries and churches as well as sunken ships or even violins of the famous violin maker families. From valuable climate data, via glaciology up to the question of trade routes in medieval times, Dendrochronology is able to contribute to all these issues. Today Dendrochronology accompanies a wide range of scientific disciplines, although it is practiced only for less than a hundred years! Dendrochronology is more than just counting annual rings. Just have a look at the following pages to get an idea of the plethora of issues Dendrochronology is able to contribute to. The laboratory at Pressler GmbH has more than 30 years of experience in Dendrochronology. Up to today an amount of over 25.000 samples from Central Europe has been analyzed, evaluated and dated. Chronologies from Germany, France, the Benelux countries, Scandinavia, the Baltic countries even up to Romania are at the disposal of the laboratory. We are able to date oak, beech, fir, pine and spruce. Work at the laboratory is accompanied and supported by longtime experience and work in the field of building research and recently in the field of archaeology as well. All disciplines complement each other in the company in an ideal way. Norway:Scroll ornament an a stave church. 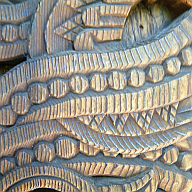 Treerings emphasized relief-like, due to weathering.